Today I had to step away from my computer, away from my work, and away from the news. I worried what might come out of my “mouth” and end up on our Facebook feed. I’ve worked hard to keep myself in check and to focus on kindness as much as possible but on days like today, this can be quite a challenge. This is why I felt it best to distance myself from things for a while. I want our page to be one of kindness – even when kindness is seems absolutely and utterly impossible. Anger is easy, it’s loud, and it’s ugly. The world needs less of it. It’s been 14 minutes. I’m not sure where to go from here. When Cookies for a Cop started, it was a fluke really. I was having a morning that I just felt incredibly negative. I felt nasty, bitter, and just plain hateful from the endless negative media coverage. It was in that moment that I decided that I could continue feeling this way or I could do something to change it. I didn’t know what I could possibly do that would matter much so I just decided to bake cookies for our local Sheriff’s office. I went to Facebook to see if some friends wanted to help. They did. Lots of them. We spread the word. We found countless trusted people who cared and joined. We baked and we delivered. Throughout this time, I contented that it was possible to support one “side” while having compassion for another. I contented that you don’t have to hate in order to support. I continued to feel compassion for families that faced heartache but that did not mean that with that, hate needed to be a part of the equation. And then, today, June 19, 2015. Texts start coming in. My day was just getting started. As I am getting the updates, my heart starts racing. I know my brother is safe but that doesn’t stop the way I am feeling. Within minutes, the news is broadcasting the first details; which aren’t much. The anger started growing and that ugliness is demanding attention. I have had enough. In the six months since our deliveries, would you believe that there have been SIXTY THREE (63) ‘in the line of duty’ deaths? In the two days preceding our deliveries, there were FOUR (4) ‘in the line of duty’ deaths. I have, slowly over these months, been finding myself feeling like I did in December. I don’t like that feeling. I want peace. I want kindness. I want people to not be so quick with hate, with bitterness, with the know it all mouth that does no good for anyone. I want people to act and respond responsibly. I want respect. I want the world to STOP. I want out of body experiences for everyone so we can look down upon ourselves and determine if our actions and our words are something to be proud of. Are we making a positive difference in our community or are we just being loud and obnoxious? There is so much that our officers already have to deal with. The current atmosphere only adds to the stress and creates a very volatile world that ends in ways that we witnessed today. End of watch is called; once again. A husband, father, friend, officer – GONE. Officer Sonny Kim’s life is struck short. The devil dances, he has claimed another. I refuse to allow the devil victory. So here I sit again tonight. Pushing my chair back and leaving my computer every 14 minutes. The baking has commenced because really, what else can I do? It is currently 11:44pm. I am not the only one up baking at this hour. 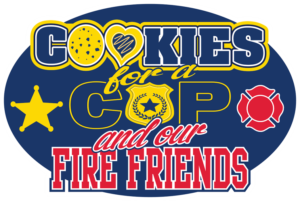 Trusted friends from around the tristate join me and in just 12 hours, with the help of friends, family, and even a donation from a local McDonald’s, we will deliver close to 600 cookies to the men and women of District 2, Cincinnati PD. While they are left with no choice but to put on their uniforms tomorrow, kissing their loved ones good-bye to head back out into the very streets that brought an end to their own, we will do what we can, in this small way, to show our support. We will continue to stand with them. Not because we hate one side and not because we don’t have compassion but because we know that it’s possible to live with both support and compassion. It’s possible to live without the hate. Fake it ’til ya make it, my friends. I feel pretty ugly inside tonight; so I shall fake it. It will be my motivator for good. Do something nice for another. Please. Thank you for all that you have done and continue to do. Praying for you and all law enforcement and their families. Oh Becky, Just know that you are not alone in your feelings. We are here and we will stand with you and do all we can to make a difference. This WILL make a difference!!! If for no one else , it will to the people that see the kindness and love that is sent and given to them!! We WILL show our country that love and compassion, and kindness are for EVERYONE ! You hang in there girl, you are not alone!!! !